Our innovative care helps you breathe easy. When you have breathing problems, we know finding the right doctor can be trying. UCHealth’s leading network of specialists across the Front Range is always here for you. Whether you’re seeking treatment for yourself or a family member, you can find the advanced care you need at UCHealth. Experience and innovation, at your service. Everything we offer is based on the latest proven testing and treatment options. From diagnosis to our recommended course of action, you can take comfort knowing that our research and experience provides you the best care currently available. 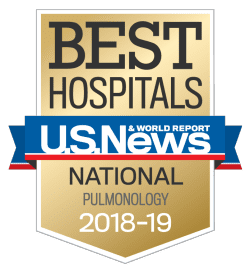 UCHealth’s Comprehensive Lung and Breathing Program in metro Denver is ranked #1 in the country by US News and World Report. Whether you live in or outside the Rocky Mountain region, our advanced lung specialists are here to see you. We use the most advanced procedures and technologies to try and relieve your short- and long-term respiratory problems. To learn more about what our nationally recognized care can do for you, call 720.848.4400. Patients with lung and respiratory conditions have the opportunity to enroll in clinical trials, which aim to improve treatment protocols and patient outcomes.